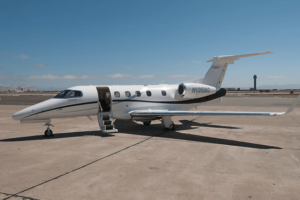 San Francisco based Pacific Coast Jet is pleased to announce the addition of a Phenom 300 to its private airplane charter fleet. Bringing the collection to nine small to midsize aircraft, the Phenom 300 adds additional flexibility and convenience for Pacific Coast Jet clients. Developed by Brazilian aircraft manufacturer Embraer, the Phenom is known for its impressive engineering while maintaining luxury and economic performance. It can take off from shorter runways and from challenging airports at high elevations and hot temperatures. The roomy 17-foot cabin accommodates six passengers with adjustable, fully reclinable seating and luxury amenities including in-flight WiFi, a fully stocked galley that is the largest in its class, the largest windows in its class, and advanced soundproofing. A full lavatory with sink gives executives extra comfort on longer flights in for a premier private jet charter experience. From local flights around San Francisco, Oakland, Sacramento, Silicon Valley, Napa, and San Jose to Coast to Coast and Hawaii, Pacific Coast Jet offers clients flexibility and luxury throughout the US. With access to an additional 5,000 private aircraft worldwide, they can also arrange charter aircraft itineraries to and from any destination you seek. Pacific Coast Jet is committed to the highest level of customer service, luxury and flexibility in charter jet travel. Based out of the San Francisco Bay Area, we charter itineraries all over the world. For more information contact us at 888.725.3871.